According to The Vision Council, 61 percent of the U.S. population is reported to wear eyeglasses, contact lenses, or other means of vision correction. When it comes to glasses, we are seeing a shift in trends, as more people are opting to embrace wearing spectacles rather than hide behind them. Whether you are someone who needs to wear glasses all the time or on occasion, it is important you understand that when and where you sport your eyewear is up to you. That being said, there are a handful of ‘perfect’ situations for glasses. Most people discover their vision is much clearer once they start wearing glasses. When you can’t see as well as you should, there’s a good chance you will want to wear your glasses all the time. If you are comfortable and don’t experience any eye strain in doing so, you are more than welcome to wear your glasses as much as you want. It is a common misconception that wearing glasses all the time will make your vision worse – there is absolutely no truth to this! In most cases, people find that they become more comfortable wearing prescription glasses because of how much better they can see. When traveling – If you are traveling by plane, opting for glasses over contacts is usually the way to go. This is because contacts can dry out your eyes and airplanes can either be stuffy or too cold. To avoid an awkward situation of having to take out your contacts mid-flight, we recommend starting your travel day by wearing your glasses. When working on the computer for long hours – It is no secret that more people are working on computers than ever before. With this shift towards technology-centered jobs, digital eye strain is becoming a serious concern. This is one situation in which opting for glasses over contacts is beneficial. Because contacts can dry out your eyes – especially when staring at a screen – glasses are the recommended vision correction aid. During a job interview – People who wear glasses have a certain air of sophistication and academia, if you will. This is why it may serve you well to wear glasses during a job interview, rather than your usual contact lenses. 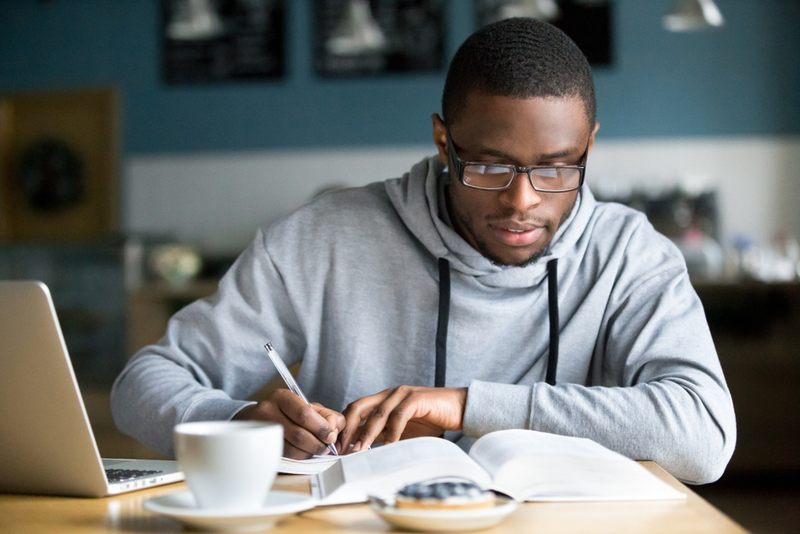 During a long studying session – Another time where it is appropriate to wear glasses instead of contacts is during an extended studying session. This ties into the above point about how spending too much time on the computer with contact can hurt your eyes. Pouring over books and taking down notes can also lead to eye strain, so your best bet is to opt for glasses when starting a marathon study session. To make sure your vision and eyes are healthy, be sure and schedule a comprehensive eye exam with a First Eye Care DFW doctor today. We are happy to discuss any of the above points and are here to provide you with the information and tools you need to maintain your eye health for many years to come.